The two-year-old Samsung Galaxy J7 was definitely not in the cards for an Android 7.0 Nougat update. However, it looks like for whatever reason Samsung has decided that the original Galaxy J7 is popular enough to be updated to Android 7.0 Nougat. 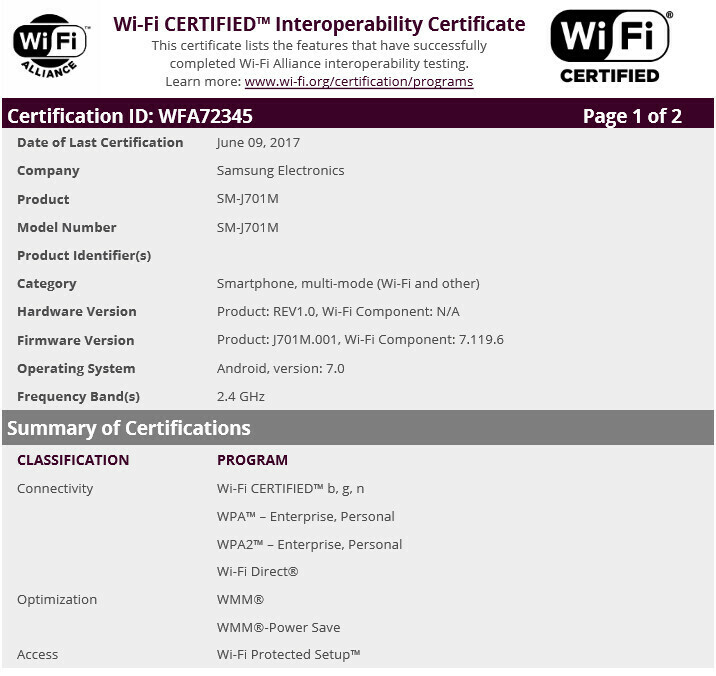 Otherwise, we can't explain why the Samsung Galaxy J7 (2015) with Android 7.0 Nougat on board recently received its Wi-Fi certification. The device is listed with model number SM-J701M, one of the many model numbers that the original Galaxy J7 was tagged with since its release. If Samsung will indeed push Android 7.0 Nougat to the Galaxy J7, it would be the second major OS update the smartphone received in one year. Samsung's mid-range handset was launched with Android 5.1 Lollipop right out of the box, but an Android 6.0.1 Marshmallow was released last year. In any case, Android 7.0 Nougat will be the last major OS update the Galaxy J7 (2015) will receive, so it would probably be best to switch to a newer device if you want to benefit from all the new features and improvements included in Android O. What about the 2016 version? According to Samsung Turkey, it's for as of August, dmitrilp. Although this certificate is strange. Samsung has not released any Galaxy J7 with the SM-J701 numbering. Could it be that the correct one was SM-J710 and, for some reason, it was spelled wrong? Now this story of SM-J701 is explained. It is a new edition of the original Galaxy J7 2015, which according to a news of the own PhoneArena, will be called Galaxy J7 Reloaded.